Does the business generate any form of revenue from the jurisdiction and/or through this address? This includes using it in advertisements and portraying it as a business location to entice business. Does the business have a presence in the jurisdiction? If you do not have employees in this location or within the city performing work for compensation, you may not need this license. 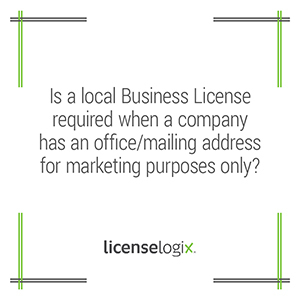 However, if you receive mail to this address relating to the business that an employee must come into the jurisdiction to collect that could be be enough to establish that the business has a presence.